Choies Jacket, Asos Top, Primark Poloneck(in store), H&M Trousers and H&M Heels. It's true. I'm going to be living in polo necks this season so I guess I better dash to Primark and stock up on these £5 basics in every single colour! They are so easy to wear and I love how versatile they are. Wearing a polo neck underneath a sleeveless dress or short sleeved top means we can take our summer staples through to winter! (You can see how I styled these polo previously here.) I've gone all monochrome today and pulled out a couple of items that have been neglected to the back of my wardrobe. This Asos 3/4 length checked top was an impulse buy after seeing checkered prints all over the catwalk last season aw13 and with this top being maternity only I took the plunge as I knew it would be snapped up in an instant. (No I'm not expecting..) These H&M trousers were a £14.99 bargain from earlier this year. Having a coloured panel to the outside not only elongates our legs but makes them look even slimmer (hallelujah!). Chucking on a long line blazer/long line anything seems to be my thing at the moment, this was exceptionally rinsed during London Fashion Week. (You can see my outfits here.) I just love the clean sharp lines this Choies jacket gives my outfit. What are your A/W staples? I just love this coat! Beautiful simple outift. 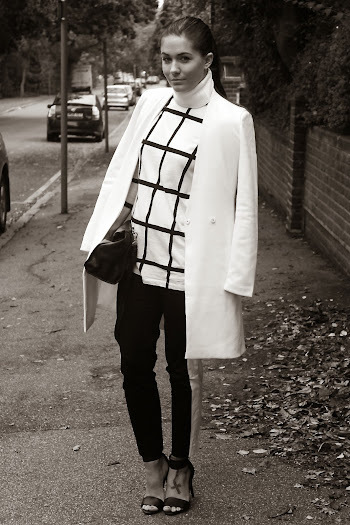 Lovely monochrome look and great layering idea! Where is your bag from?? Its fabulous! need that white coat its lush!! great look! lovely blog hun....new follower here if you would like o check me over at http://sophie-henderson.blogspot.co.uk/ and follow back id be gratefull! This is probably one of the best monochrome outfits I've ever seen! And those shoes.... wow. Move over pastel pink jacket you have been replaced by a beauty!